I had too much fun with Sofiere Maja Papers and die cuts for this hat. Tilda is laying on Little Darlings die and Peony doohickey die surrounded by florals from LLC. A resin cupcake sits in the mix. 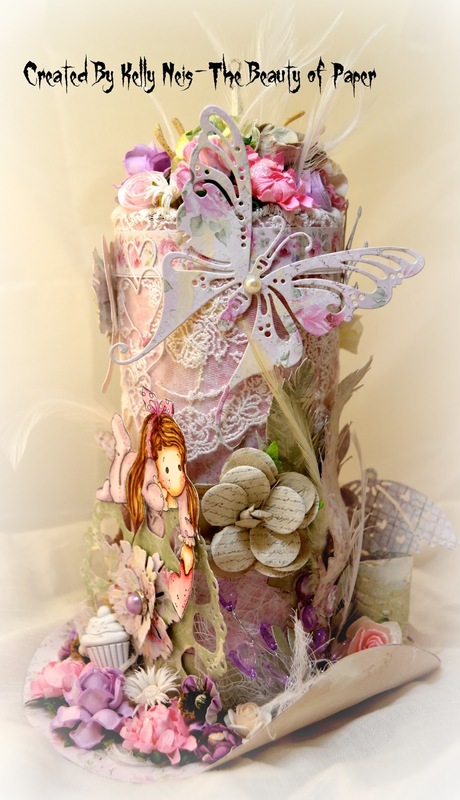 On the side is a big doohickey butterfly, Magnolia crystals, and Prima flower, the paper feathers are part of the template. I covered the top part of the hat with lace. The crown is from LaLa Land and you can see more of the paper bow from the template which I decorated with flowers and doohickey wings. I also put a tea cup charm on the bottom and filled it with chunky purple glitter. You can see the doohickey umbrella die on the paper bow as well as the doohickey heart that I stuck into the hat. The white feathers are real from my chickens. 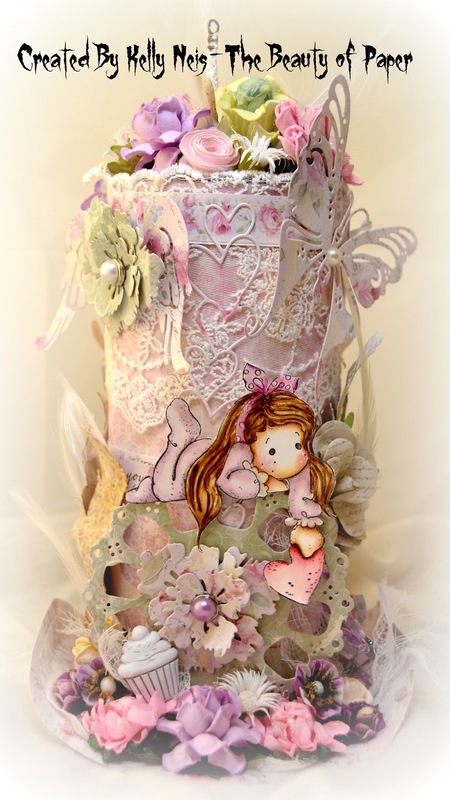 Tilda with Dot Bow is colored in Distressed inks and taped to the Little Darlings Die. Melissa Francis resin cupcake in florals. The flower doohickey in the middle is Peony. 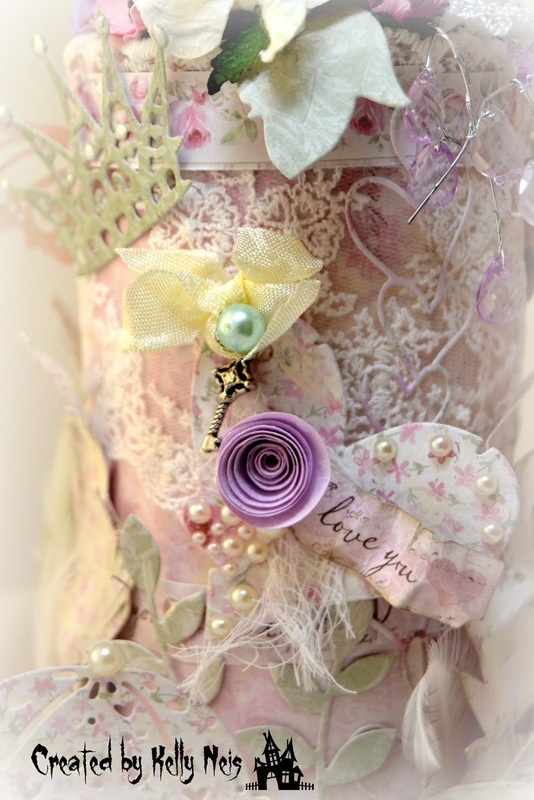 The Doohickey heart is affixed with a pearl pin and adorned with a purple Kordt and Gott rolled rose, pearls and the words "I love you" from the border of the Sofiere paper. Doohickey angel wings and umbrella are sitting in the paper bow created from the original template of the hat from the Cutting Cafe. The bottom left is a tea cup charm that I filled with chunky purple glitter. The top has a lot of flowers but on the one side I hung the Magnolia Chandelier crystals and put some small lace on the top. I Frantaged in Shabby White a metal charm the Eiffel Tower and painted the wooden spool, lastly sprinkled with chunky glitter. 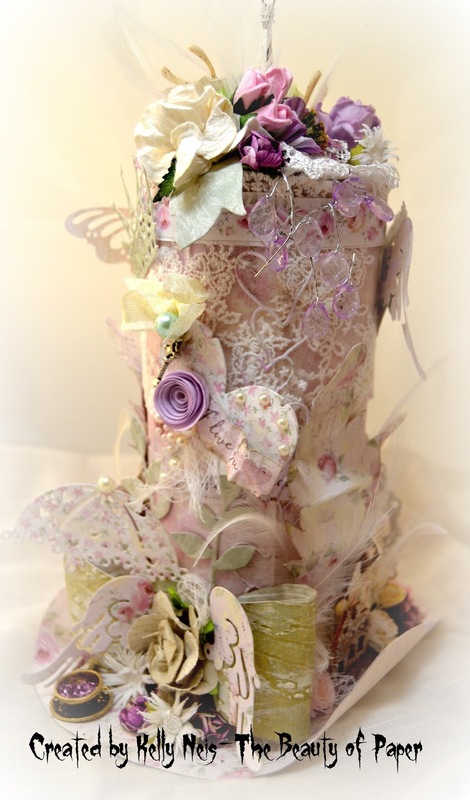 Hope you enjoyed my Shabby Chic Top Hat and use the template available at The Cutting Cafe because it was easy and so fun to embellish! Have a wonderful day!! 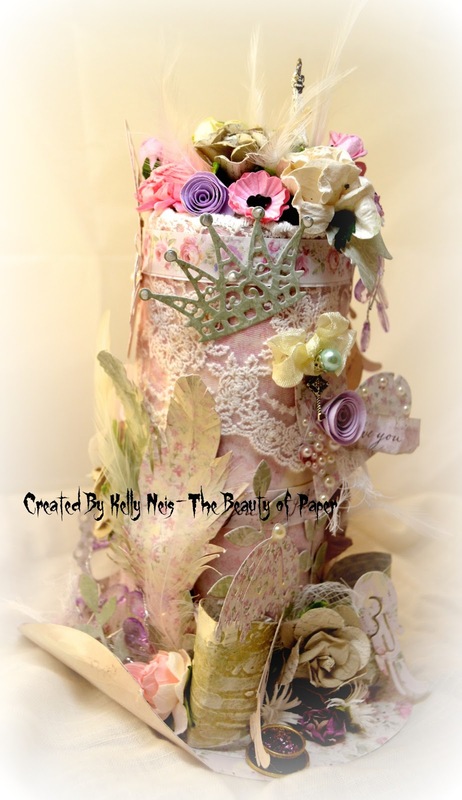 Stunning Top hat Kelly, beautifully decorated with so many amazing details to catch the eye. 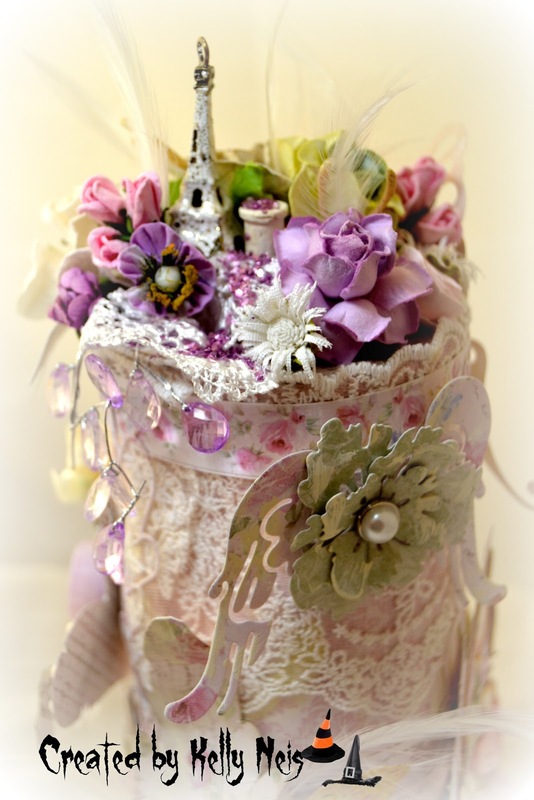 Thank you for joining in our 100th Special Celebrations Challenge over at Midweek Magnolias. Good luck! Where do I start??? This is fabulous with so many gorgeous details. This is the first decorated hat I've seen (other than Halloween) and you have done an outstanding job. So much time and love went into this beauty!! Hope you've had a lovely Sunday! OMG, Kelly, this is absolutely luscious.....you did an outstanding job on this magnificent creation!!!!!. BRAVO!!!! Your friend will treasure this! Amazing ! so niiiiiiiiiice ! congrats for this superb work ! Wow, your friend is so lucky to be receiving this beautiful work of art! 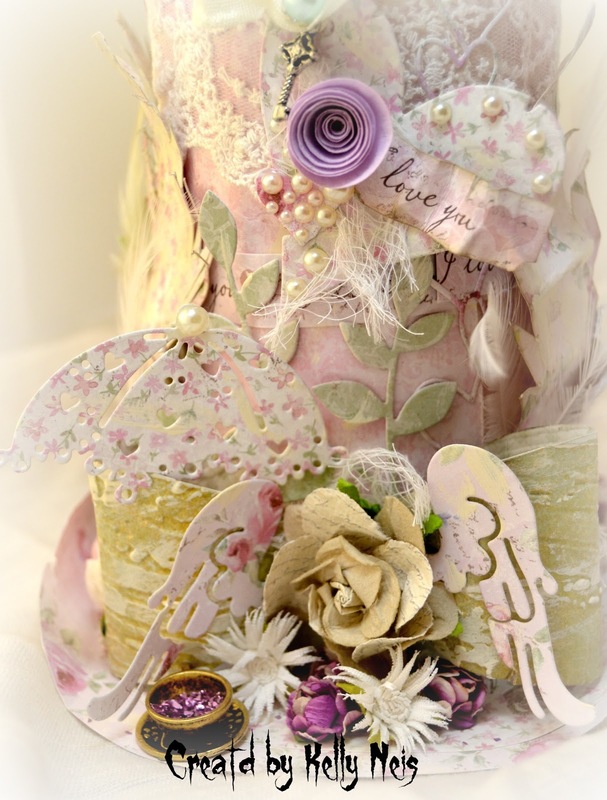 Love all the bows, charms, flowers and die cuts that all look so wonderful together. WOOO HOOO!!! Chica, this is out of this world. Your friend is going to have her socks knocked off. What you did to this hat is jaw dropping. Holy smokes chica, I wanna come work by the waterfall now too!!! ;) It's sensational and Happy Birthday to your friend too. Love your little Halloweeny images with your name signature too. Well...this is super duper fabulous!!!!! You just totally amaze me all the time! Thanks for sharing it with us at www.7kidscollegefund.com! Hi Kelly! This is a fantastically gorgeous Hat! I love the colors! Thank you so much for sharing it with us at the Tilda's Town Challenges this week!